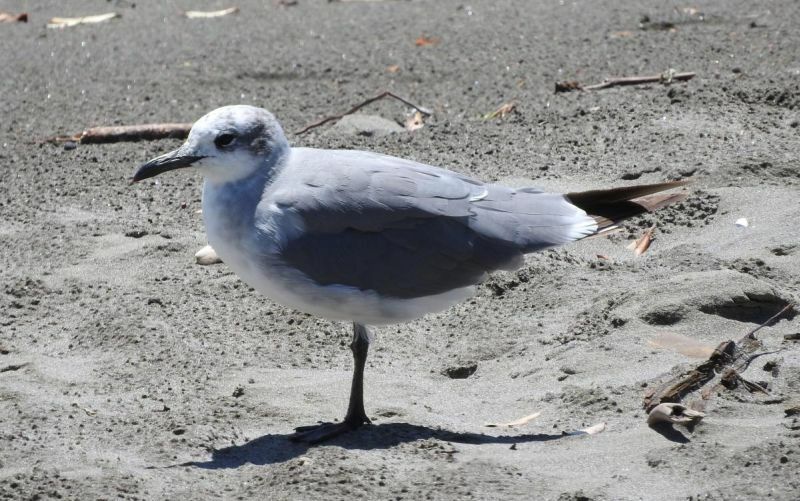 Christmas arrived two days early for Waikato bird-watchers Annette Taylor and David Riddell when they spotted New Zealand’s first laughing gull. They were heading to Gisborne, and had stopped for a picnic at Te Ahiaua Reserve, 7 km west of Opotiki in the eastern Bay of Plenty. 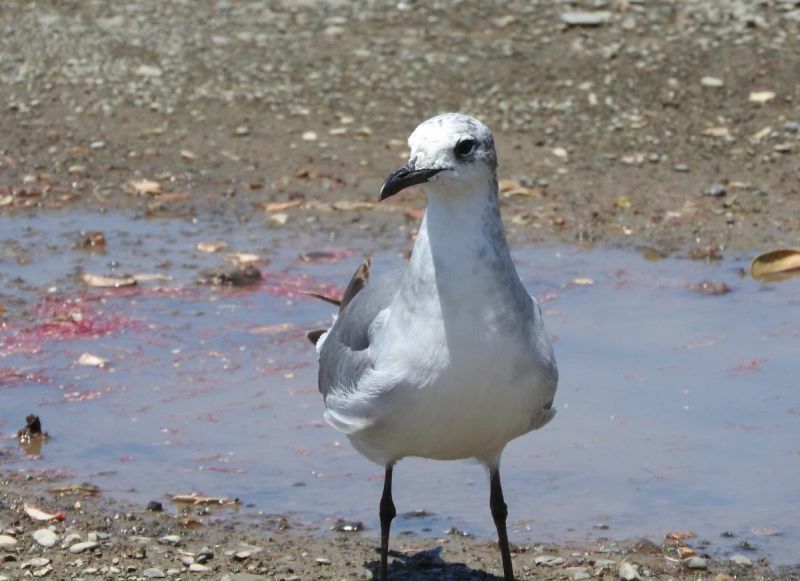 Te Ahiaua Reserve is on the shore of the Waiotahi River estuary, and like most coastal road ends, it supports a small flock of red-billed gulls, waiting for handouts. 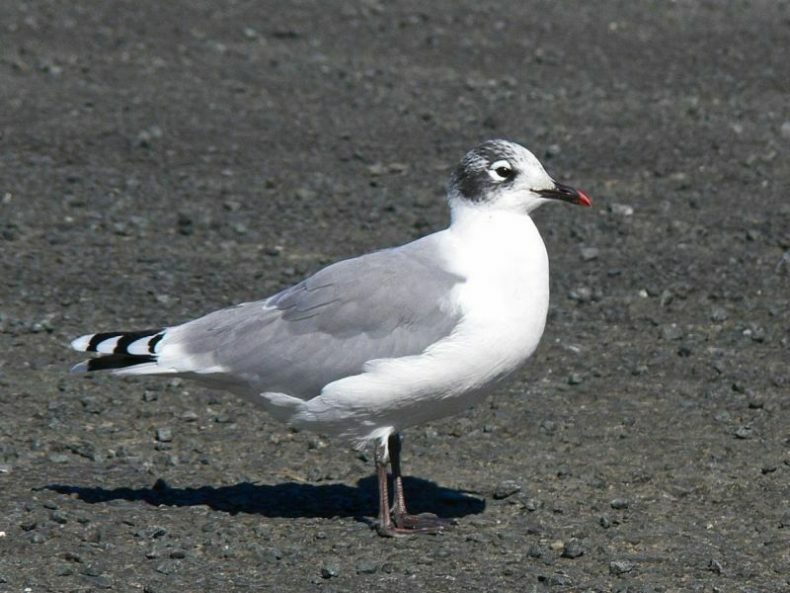 It was Annette who first noticed the unusual visitor, casually commenting ‘Oh look, a Franklin’s gull’ – referring to another rare vagrant that has reached New Zealand on three or four occasions. Annette and David had seen a Franklin’s gull at Papakura in 2009, and the Te Ahiaua bird did look similar, with both birds having a few black feathers on their heads, hinting at their smart black-headed look when in breeding plumage. David posted a few images of the bird on the birders’ webforum BirdingNZ.net, and within 90 minutes the first suggestions that it might be a laughing gull popped up. This was further supported when David posted more and better images a few hours later. 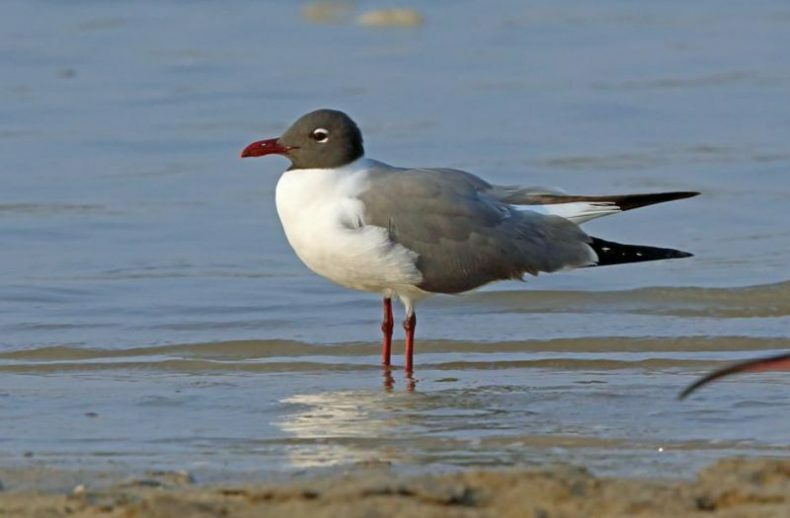 Laughing gull and Franklin’s gull are two closely related and similar-looking species that mainly breed in North America and migrate to Central and South America. 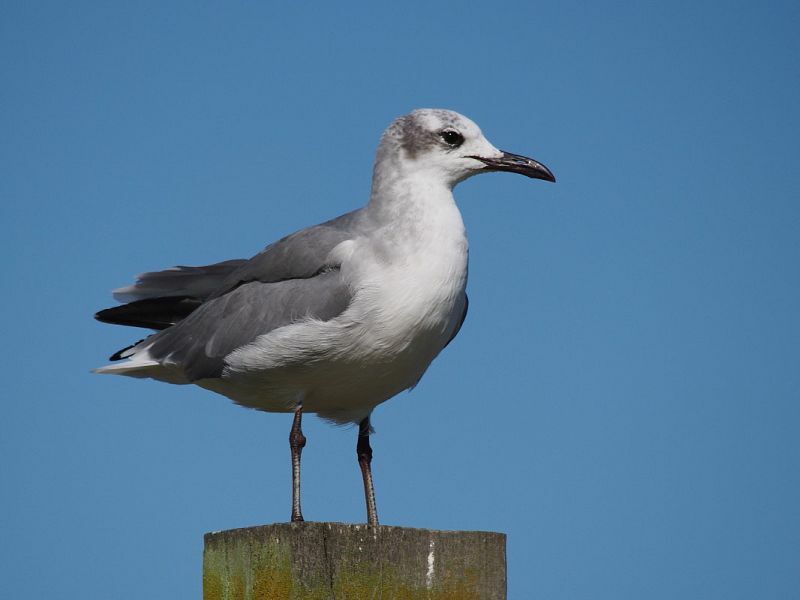 The laughing gull is the larger and more coastal of the two, and had long been expected to turn up in New Zealand. The first Australian record of a laughing gull was at Cairns in 1987. There have been at least ten subsequent reports scattered from Western Australia to Tasmania, Lord Howe Island and Torres Strait, with most records on the Queensland coast. They have also turned up in French Polynesia (Mangareva), Samoa and Pitcairn Island. 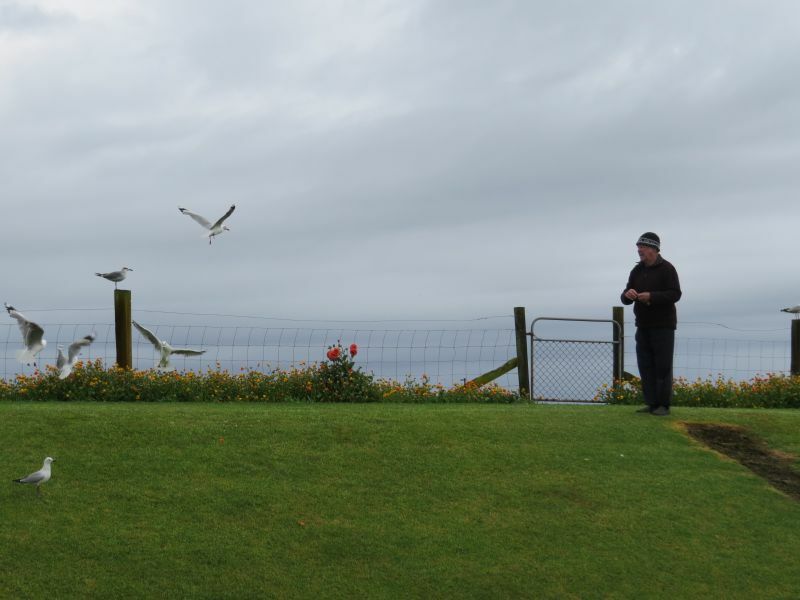 Many New Zealand bird-watchers rejigged their holiday plans to make the pilgrimage in search of this New Zealand ‘first’. Over the following two weeks it was located at five different sites over a 17 km stretch of coast from Ohiwa Harbour to Opotiki. It soon became apparent that the bird had been present for at least 4 weeks before coming to the attention of bird-watchers. At the eastern end of its known range, Ray and Patricia McNamara regularly feed gulls in their backyard alongside the Otara River, near the Opotiki wharf. They had noticed the unusual gull among the clamorous red-billed gulls since late November 2016, and wondered if it was some kind of hybrid. 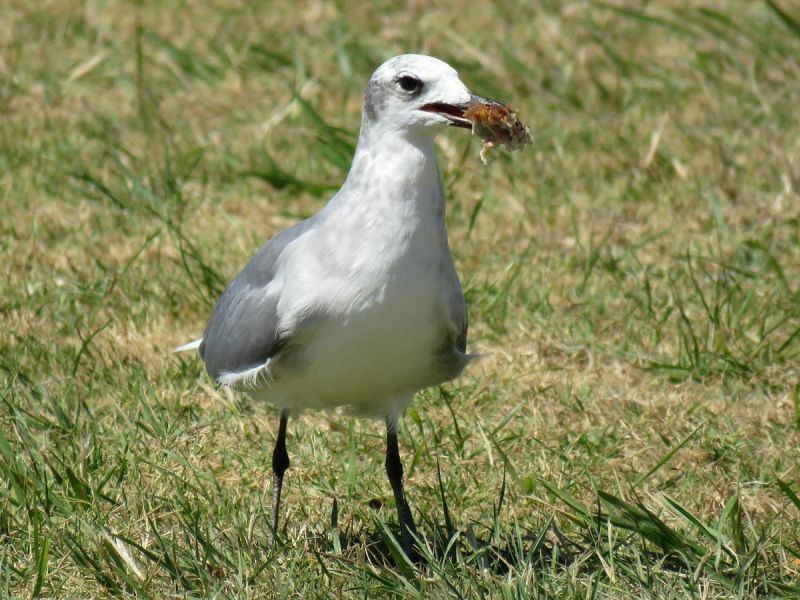 They even coined their own name for it – the ‘quacking gull’ – based on its unusual call. The laughing gull was very confiding for most observers. It readily approached within a few metres, competing with the other gulls for food scraps – and had a particular liking for chicken! Many great photographs were taken and submitted to New Zealand Birds Online, showing its distinctive features. 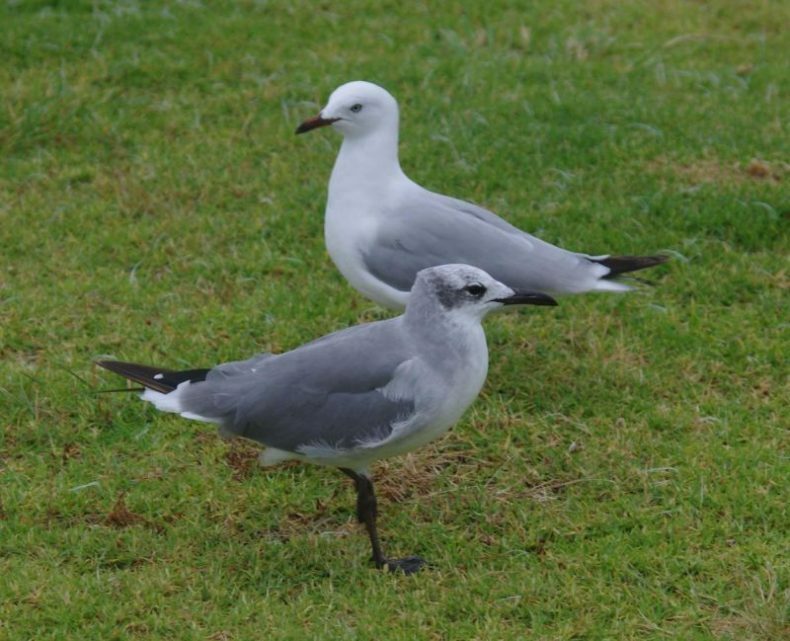 Compared to the red-billed gulls it was among, it was slightly larger and darker on the back, with a longer bill, and dark markings on its head. 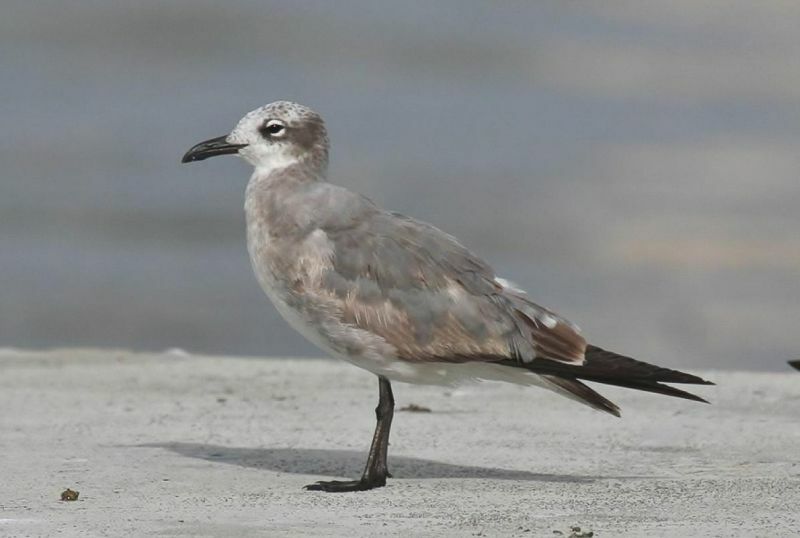 It differed from a non-breeding Franklin’s gull in being larger and darker with a longer bill, legs and wings, and darker wing tips without the prominent white ‘windows’ that most other gull species have. 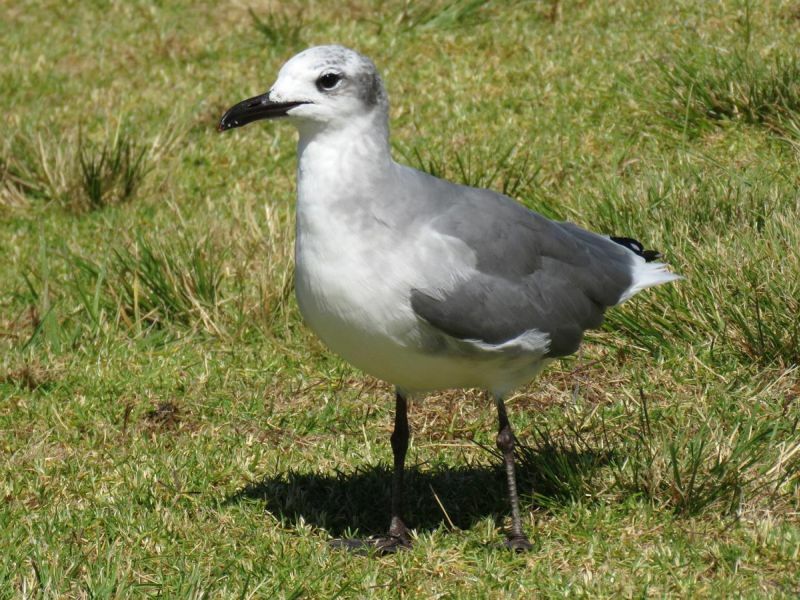 David and Annette submitted their sighting to the Birds New Zealand Records Appraisal Committee in late December, and it was accepted unanimously when the next batch of comments was collated at the end of February. Congratulations David and Annette on finding this latest addition to the New Zealand bird list! We are all hoping that this bird will stay long enough to develop its smart breeding plumage, which should occur by mid-March.